View cart “Quartz, var. Amethyst” has been added to your cart. 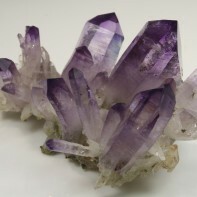 Sharp cluster of purple Amethyst crystals from Vera Cruz, Mexico. These gemmy beauties were very popular in jewelry when they were coming out in mass during the 1970’s and 1980’s. Now, due to the nature of life in that part of Mexico, production is very limited. This is one of the specimens from the gem quality finds of the 1970’s. An impressive cluster and perfect for any collection.